The main event of this celebration is the military parade to mark the 69th anniversary of the victory, which will take place at Moscow’s Red Square (as well as in 24 other Russian cities). 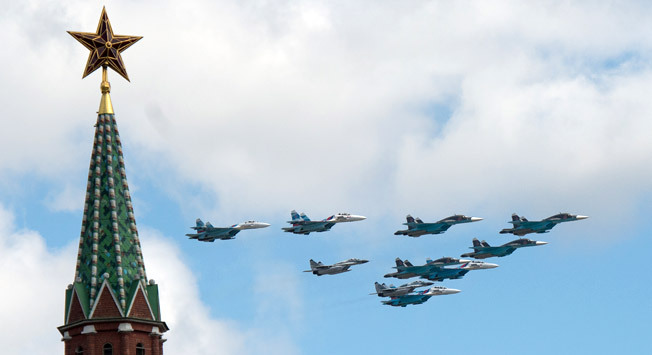 At this time, 69 aircraft and helicopters of the Russian Air Force will fly over the country’s capital – fighter jets, bombers, attack aircrafts, and the aerobatic teams – Strizhi (Swifts) and Russkiye Vityazi (Russian Knights). Missile complexes, armored personnel carriers and tanks will be paraded along the main streets of Moscow. In addition to a parade on May 9, a huge number of events, dedicated to Victory Day, are planned in Moscow. After the parade ends, traditional festivities will be held on the main squares of the capital city. On Red Square, Poklonnaya Hill, in the park near the Bolshoy Theater, on Tverskaya Boulevard and in Gorky Park, people will have a chance to meet with veterans, listen to their war front stories and congratulate them on this holiday. Theater Square, Teatralnaya Subway Station. Gorky Park: 9 Krimskiy Val. At 3:00 p.m. (15:00) on the Walk of Remembrance on Poklonnaya Hill will start the event called “Moscow Remembers”. Participants of the march in honor of the victory in the war are asked to bring along photos and memorabilia, medals and letters from the front, from their relatives who took part in the fighting and those who died for their homeland. Start of procession 3:00 p.m. (15:00). Walk of Remembrance, Poklonnaya Hill. A grand gala program is being organized in Sokolniki Park. On this day, they will launch an open-air museum of military equipment, a solemn parade of divisions will take place, music of the war years will be played, and lectures on history will be read. The younger guests will be provided with play areas and treated to costumed performances. On Poklonnaya Hill at 5:00 p.m. (17:00), people will be able to watch demonstrations of equestrian performances. To the music of the Presidential Orchestra, the audience will be treated to the performances of the Silent Drill Platoon and the Presidential Regiment. Poklonnaya Hill: 7 Bratyev Fonchenko Street. For this holiday, they will recreate in the garden the atmosphere of the victorious May of 1945. Visitors will listen to wartime music, watch dances and be treated to meals from the field kitchen. The main avenue of the garden will host an exhibition of vintage cars. At 6:00 p.m. (18:00), the tenth annual Victory Ball will begin on the main square of the Hermitage Garden. This event has been held every year since 2004, involving more than 10,000 representatives of various military educational institutions, students, cadets, and members of Moscow military history clubs. On the wooden terrace of the Muzeon, as soon as the sun sets, visitors will be able to watch old wartime movies. These will be shown in the open air using retro technology – a screen and projector from the war years will be used to lend authenticity to these performances. Muzeon Art Park: 2 Krimskiy Val. The holiday celebrations will end with a big artillery salute and fireworks. This year it will start simultaneously from 16 points in the city. The salute will last 15 minutes. Traditionally, the best places for viewing are the bridges across the Moskva River – Andreyevskiy (Andrew’s) Bridge, Patriarshiy (Patriarchal) Bridge, Bolshoy Kameniy (Great Stone) Bridge, Bolshoy Moskvoretsky and Ustyinskiy Bridges, etc. ), and the observation deck on the Sparrow Hills, All-Russia Exhibition Centre and Poklonnaya Hill. Please arrive early – as every year thousands of people come to see these fireworks. Red Square is still the place from which fireworks are launched, but watching them from there is inconvenient –due to the Kremlin’s buildings obstructing the view.